tractor to raise awareness and support for the fight against breast cancer during the October National Breast Cancer Awareness month. The unit was unveiled at TICO’s annual company picnic on Saturday, October 17, 2015. Breast Cancer Awareness has been gaining a lot of attention and traction through the support of businesses in recent years, an effort that TICO was eager to lead locally as well as in its industry. The Breast Cancer Awareness edition Pro-Spotter is a special edition only unit, produced especially to show support for all those affected by breast cancer. TICO Manufacturing General Manager, Frank Tubbert, commented; “We are so pleased and humbled to be able to produce something so special and unique in the industry. To join together as a company in support of breast cancer awareness…our hope is that this special edition truck serves as a symbol of this company’s and our employees’ ongoing support for the fight against breast cancer, especially since it has affected some that are a part of the TICO family”. TICO (Terminal Investment Corporation) has been manufacturing its Pro-Spotter terminal tractor for retail availability since 2008. The Special Edition Breast Cancer Awareness unit is a DOT/EPA certified 2016 Pro-Spotter. 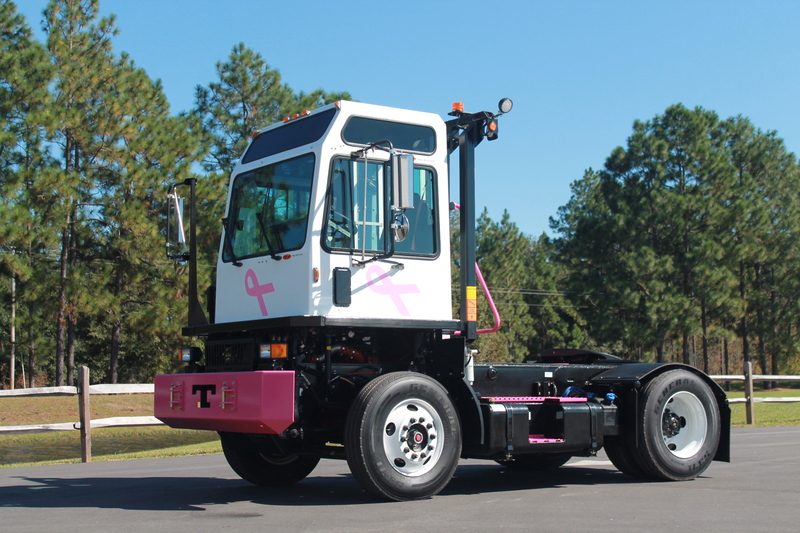 It features the familiar TICO bumper but painted pink, as well as pink handrails, steps, grating, cab raise handle, and special edition pink ribbon cab decals. The special edition truck is being made available to TICO’s North American distributor network for immediate sale. A portion of the proceeds from the purchase of the special edition unit will be donated to a cancer organization of the customer’s choice, in the name of someone that has been affected by the disease, also provided by the customer. “The entire workforce really came together behind this special project, ever since the idea’s inception. It was something that everyone really got excited about and took pride in with everyone working to make the common goal with this whole project a reality”, said Tubbert. TICO Manufacturing is the quality manufacturer of the Pro-Spotter On and Off-Highway terminal tractor, for use in distribution centers, rail terminals, and ports, as well as the Pro-Shuttle terminal trailer. TICO terminal tractors are built “For The Real World” in Ridgeland, SC. For more information, please visit www.ticotractors.com.